Donald Trump has been given a variety of ideological labels ranging from “radical” to “fascist” to plain old-fashioned “unprincipled.” But even though he’s drawn a decent number of self-identified moderate votes in Republican primaries, moderate is not a word that would seem to fit him, which could certainly be a problem in a general election. 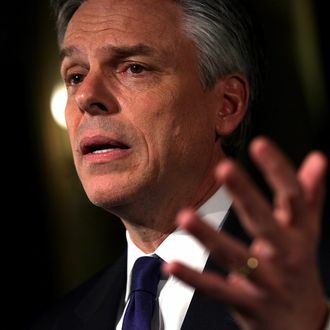 So along comes hypermoderate Republican Jon Huntsman with the beginnings of a makeover. Huntsman, you may recall, is the former GOP governor of Utah who transitioned from being Barack Obama’s ambassador to China to a clumsy and unsuccessful 2012 presidential candidate who imagined there was ample turf to seize to Mitt Romney’s left. He subsequently surfaced as a co-chair (along with former Democrat Evan Bayh and former whatever Joe Lieberman) for the No Labels organization, the centrist group that aims at coming up with a policy agenda that a critical mass of Republican and Democratic office-holders can theoretically embrace. Hmmm. A “nontraditional bloc of supporters.” Is Huntsman telling us Trump is a bipartisan sorta guy who doesn’t need to “move to the center” because he’s already there? Wonder what Huntsman’s 2012 chief strategist John Weaver, now in a similar role with John Kasich, would have to say about that. For that matter, what would Huntsman’s fellow China hands think? Probably nothing positive.